WizKids has unveiled the Dungeons & Dragons Icons of the Realms: The Falling Star Sailing Ship, a mammoth miniature first teased at Toy Fair (see �'Magic: The Gathering' Minis, Massive 'D&D' Ship, Black Dragon Trophy�). The fully-painted miniature is 17.2" tall, 33" long, and 6.4" wide (12.6" wide at the masts). 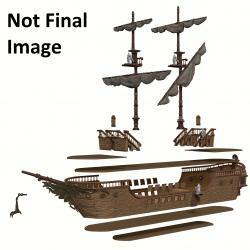 It includes reversible deck tiles (with or without grid lines), multiple stackable deck tiles so players can fight on the deck or in the hold of the ship, magnetic removable masts, removable stair cases, and working hatches. MSRP is $249.99. Release is currently slated for January 2019. WizKids suggested paring the ship with the recently released Kraken and Islands Case Incentive which was released with the D&D Icons of the Realms: Monster Menagerie III set (see �WizKids Brings Giants Back in 'Monster Menagerie III'�).